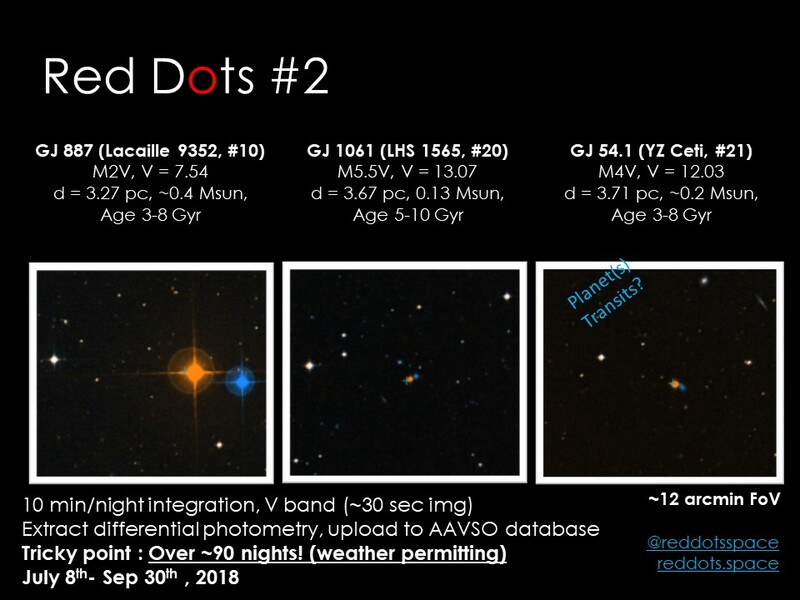 The analysis and papers from Red Dots #1 (2017 campaign) are progressing (a bit slower than anticipated), but science publications and results expected soon. In the meantime, Red Dots #2 starts today (July 8th) at HARPS/ESO. As before, we require quasi-simultaneous photometry covering as many nights as possible during the run. GJ 887 (Lacaille 9352) is the 10th starsystem near the Sun. It is a single early time red dwarf (spectral type M2V), and it is relatively bright. This makes easy to collect photons on the star (V mag = 7.4), but it makes a bit hard to find suitable reference stars within small field of view. Smallish apertures (10-20 cm) with large field of view might work better for this one. No planets have been reported on this one, although there is abundant data from previous campaigns, which is hard to interpret due to strongly uneven sampling and diversity of instruments used. The possible rotation period is estimated to be between 30 to 60 days, so it should be easily detectable within the 90 days campaign. Determining this rotation period, and an estimate of the flare rates are the primary goals for this star. GJ 1061 (LHS 1565) is a small red dwarf very similar to Proxima Centauri. However, it seems to be rather more stable and less active. There are a few spectra taken before with HARPS and UVES, shich confirm that the star seems to be inactive. The rotation period is unknown, but it is likely longer than 50 days (to be compared with Proxima Cen’s rotation period at 83 days, and Barnard’s star at >120 days). Being such a small stable star, prospects and sensitivity towards the detection of low mass, terrestrial planets in temperate orbits is rather high (possibly in the range of 30% according to occurance rates estimates). Contributors of datasets used in the papers will be included as co-authors in the possible publications, and even if the set is not sufficient, we will do our best to feature any contributed work on the papers and/or social media en website. Frequent updates on twitter and facebook, and expect 1 update per week on the website for the progress of the observations! The image contains the basic information you will need to decide or plan observations. Be aware these are southern hemisphere targets, although some can be done from northern observatories. I have started observing all the three stars. I just now looked up this webpage and observed that the information pf YZ Cet is incomplete and stops suddenly. 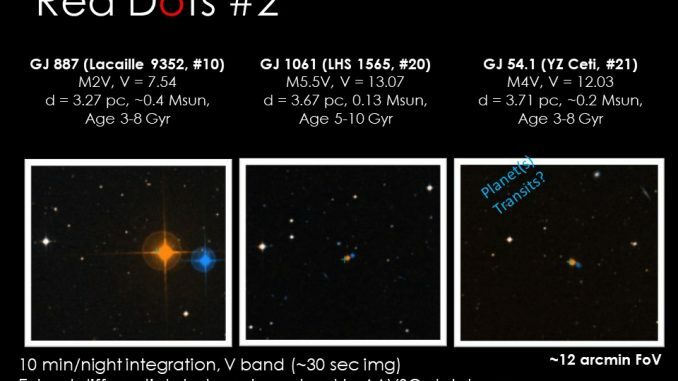 My YZ Cet data are with the AAVSo as this star is in their database already. It was also a pleasure meeting Guillem Anglada-Escude as the ercent BAA-AAVSO meeting in Warwick, July 7-8.